The Christ of the Ozarks in Eureka Springs, Arkansas is a 7-story statue of Christ. On the grounds of The Great Passion Play, it is one of the most visited attractions in the Ozarks. Since 1966, the monumental statue has overlooked Eureka Springs and stands as a symbol of hope. The inscription on the bottom of the memorial statue from John 12:32 reads, "And I, if I be lifted up from the earth, will draw all men unto me." 2016 marks 50 years that it has overlooked Eureka Springs! Throughout the month of December and until January 25, the Christ of the Ozarks will be lit by Signs and Wonders Ministries in Tulsa, Oklahoma - "GLORY TO YESHUA WHO RULES AND REIGNS NOW!" Read about how the Christ of the Ozarks was built. Have you ever seen the Statue? Review the Christ of the Ozarks on TripAdvisor! 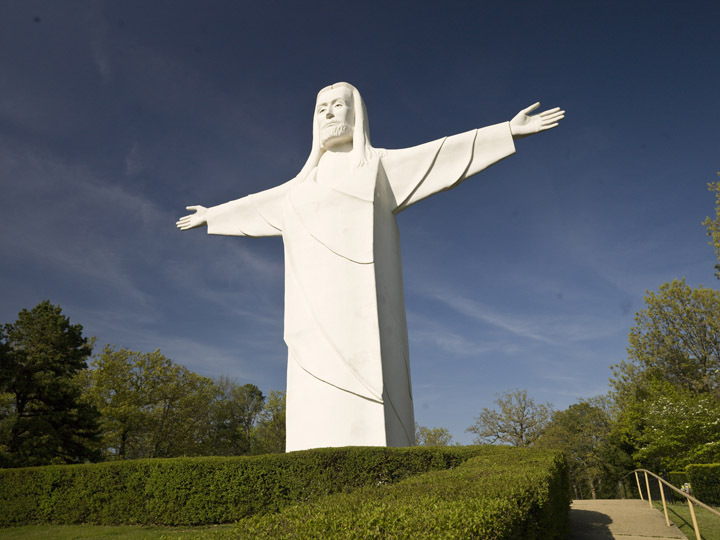 Have you ever visited the Christ of the Ozarks?